When Donald Trump killed the Trans-Pacific Partnership, a "trade deal" that had been negotiated by representatives of multinational corporations and government bureaucrats in utmost secrecy in order to give corporations the power to decide which labor, environmental and safety laws they'd obey, I started to hear from "progressives" who had suddenly discovered the deal, and decided that if Trump was against it, they should be for it. There was a comedian on the Fake the Nation podcast who described it as a way to fight Chinese influence in the Pacific (this is a talking point from the banker-friendly wing of the Democratic Party), and tweets like this ("Congratulations, the TPP is dead. You helped defeat the secret plan to make the world a better place. #RIPTPP") from people whose feeds are filled with anti-Trump messaging and causes. TPP wasn't a "secret plan to make the world a better place." It wasn't even a trade deal. Virtually every good manufactured in virtually every one of the 12 TPP members could be imported into virtually any of the other members with no tariffs at all -- something CNN conveniently failed to mention. What was TPP then? A sweetheart deal for giant corporations: it would have banned states from keeping their citizens' data out of the NSA's reach (a gift to the James Clapper set), allowed Hollywood to put people in jail for watching movies the wrong way (a gift to the SOPA set), allowed telcoms giants to sue to dismantle net neutrality protections (a gift to the Comcast set), jacked up the price of pharmaceuticals for the poorest people in the world (a gift to the Shkreli set), banned governments from requiring open source code for public procurements (a gift to the Microsoft set), limited fair use (a gift to the Righthaven set), required all states to establish criminal sanctions for breaking DRM (a gift to the printer ink business-model set), and expanded copyright terms across the board (a gift to the Disney set). 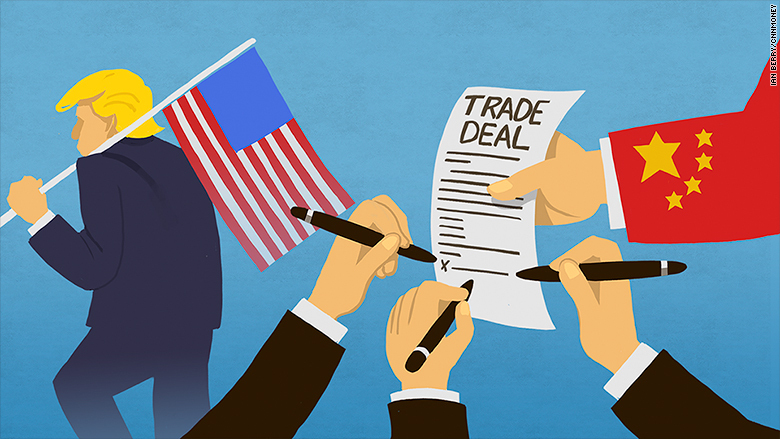 TPP set out investor-state dispute settlement terms that would let corporations sue governments to dismantle their financial, public safety, labor, and environmental laws. For example, banks would get to write their own financial regulations, and tuna companies could ban "dolphin safe" labels from their competitors' cans. This is not a "secret plan to make the world a better place." It's also not a way to beat back Chinese hegemony in the Pacific Rim. It was a way to let corporations take over democratically elected governments and write their own laws. The fact that Donald Trump hates the TPP (for his own stupid reasons, e.g., "A bunch of people I don't like, such as establishment Republicans and Democrats, want TPP, so I can look good to my base by killing it") does not make TPP good for America, bad for China, or anything but unmitigated awful. TPP's advocates were neoliberals, people who believe that markets solve all our problems and that corporations should operate without regulation or democratic accountability. Trump doesn't like neoliberalism, he likes nationalist capitalism, the Russian model where only domestic oligarchs are allowed to loot powerful nations, and then they grow their fortunes by looting less-powerful nations. This is the opposite of neoliberalism, which lets any oligarch loot any country, even powerful ones (this is why Putin hates the EU -- it allows the investor class of all member-states financialize and gut the industries of all the other states, without regard to the donor-state's power. That's how the UK came to sell off so much of its essential state apparatus, at fire-sale prices, to multinational firms that originated in EU member-states). Sometimes, Trump's hatred of neoliberalism and his love of nationalist capitalism will create a Venn intersection that contains some genuinely good policies, like killing TPP (also: attacking the outsourcing of industrial jobs to countries with weaker environmental, labor and safety laws). The fact that Trump hates outsourcing and TPP doesn't make them good, it makes Trump a stopped clock who is right twice a day. Establishment Democrats condemned Bernie Sanders and his supporters for sharing some of Trump's agenda, but they were missing the important part: pay attention to why, instead of what, and you can easily discern Trump policies from Sanders policies. For example, Trump attacked big finance ("These guys are getting away with murder") and then immediately appointed a bunch of ex-Goldman Sachs bankers to run the nation's financial regulation (this, by the way, is exactly what Obama did, and also what Clinton was poised to do). Sanders' response to Trump was to point out that Trump was a fraud, that he was continuing the corruption he'd promised to dismantle, appointing a cabinet of billionaires after promising the abolition of "a government that works for Wall Street and for special interests but not for the people." The problem with Wall Street isn't who likes Wall Street, it's what Wall Street does. Not every thing Trump does will be wrong, and we can laud the policies that do good things without letting Trump off the hook or praising trumpism. Trump killed TPP because he wanted to undermine Obama's legacy. He should have killed TPP because it's a sweetheart deal for giant corporations at public expense. It may be harder to make Trump look stupid by expressing this nuance, but if you become a TPP cheerleader because Trump hates it, you are part of the problem. Big league. Trump hates CNN because they don't give him a pass when he lies. You can cheer CNN on for its callouts without letting it off the hook for being a corporate cheerleader. The way to defeat trumpism is to develop an alternative program, a coherent one that puts people ahead of profits, that acknowledges that the system is rigged, that demands better and never settles. Yes, the Affordable Care Act is how me and my family get our healthcare, and it's better than nothing, but it is much worse than the single payer system that all the civilized countries of the world use -- a system that is consistently cheaper and better than ACA or the chaos that preceded it. We can condemn Trump for dismantling ACA because he's not replacing it with single-payer, rather than insisting that a system that's raising premiums by 25%, removing lifesaving medicines and procedures from its coverage, and fattening the corrupt insurance industry is anything more than a better-than-nothing bandaid that should be replaced with something better as quickly as possible.